Definition at line 2081 of file lscript_tree.h. Definition at line 2084 of file lscript_tree.h. Definition at line 2089 of file lscript_tree.h. 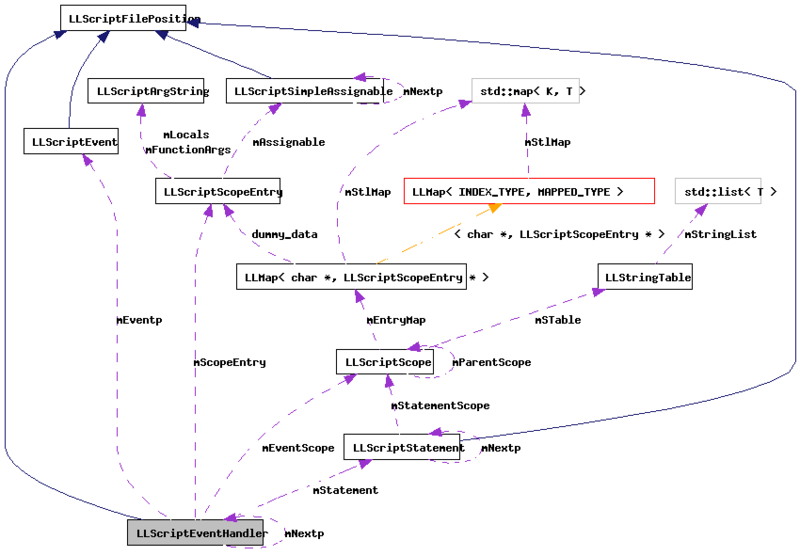 Definition at line 8715 of file lscript_tree.cpp. Definition at line 8747 of file lscript_tree.cpp. Definition at line 8724 of file lscript_tree.cpp. References gErrorToText, LLScriptGenerateErrorText::getErrors(), LSCP_PRETTY_PRINT, mNextp, and NULL. Definition at line 8771 of file lscript_tree.cpp. References add_return(), LLScriptByteCodeChunk::addBytes(), LLScriptScope::addParentScope(), LLScriptArgString::addType(), LLScriptByteCodeChunk::connectJumps(), FALSE, LLScriptFilePosition::fdotabs(), gCurrentHandler, gErrorToText, get_event_handler_jump_position(), LLScriptGenerateErrorText::getErrors(), getSize(), gonext(), gScopeStringTable, integer2bytestream(), LIT_HANDLER, LSCP_DETERMINE_HANDLERS, LSCP_EMIT_ASSEMBLY, LSCP_EMIT_BYTE_CODE, LSCP_EMIT_CIL_ASSEMBLY, LSCP_PRETTY_PRINT, LSCP_PRUNE, LSCP_RESOURCE, LSCP_SCOPE_PASS1, LSCP_SCOPE_PASS2, LSCP_TYPE, LSCRIPTDataSize, LSCRIPTStateBitField, LSPRUNE_EVENTS, LST_INTEGER, LST_KEY, LST_LIST, LST_NULL, LST_QUATERNION, LST_STRING, LST_VECTOR, LSTT_AT_ROT_TARGET, LSTT_AT_TARGET, LSTT_ATTACH, LSTT_CHAT, LSTT_COLLISION, LSTT_COLLISION_END, LSTT_COLLISION_START, LSTT_CONTROL, LSTT_DATASERVER, LSTT_EMAIL, LSTT_HTTP_RESPONSE, LSTT_INVENTORY, LSTT_LAND_COLLISION, LSTT_LAND_COLLISION_END, LSTT_LAND_COLLISION_START, LSTT_LINK_MESSAGE, LSTT_MONEY, LSTT_MOVING_END, LSTT_MOVING_START, LSTT_NO_SENSOR, LSTT_NOT_AT_ROT_TARGET, LSTT_NOT_AT_TARGET, LSTT_OBJECT_REZ, LSTT_REMOTE_DATA, LSTT_REZ, LSTT_RTPERMISSIONS, LSTT_SENSOR, LSTT_STATE_ENTRY, LSTT_STATE_EXIT, LSTT_TIMER, LSTT_TOUCH, LSTT_TOUCH_END, LSTT_TOUCH_START, mbNeedTrailingReturn, LLScriptByteCodeChunk::mCodeChunk, LLScriptByteCodeChunk::mCurrentOffset, mEventp, mEventScope, LLScriptScopeEntry::mFunctionArgs, LLScriptScopeEntry::mIdentifier, LLScriptScopeEntry::mLocals, mScopeEntry, mStackSpace, mStatement, LLScriptArgString::mString, LLScriptEvent::mType, NULL, print_cil_local_init(), print_return(), LLScriptStatement::recurse(), LLScriptEvent::recurse(), S32, and TRUE. Definition at line 2106 of file lscript_tree.h. Definition at line 2102 of file lscript_tree.h. Definition at line 2105 of file lscript_tree.h. Referenced by recurse(), and ~LLScriptEventHandler(). Definition at line 2104 of file lscript_tree.h. Referenced by addEvent(), and gonext(). Definition at line 2107 of file lscript_tree.h. Definition at line 2109 of file lscript_tree.h. Definition at line 2103 of file lscript_tree.h.